Out this month as part of the latest batch of Galaxy sponsored ‘Quick Reads’, The Little One is an apt title for such a brief tale. 124 pages would be no where near sufficient for many writers to achieve such a tension filled and outright creepy tale. But in the hands of Lynda La Plante I think her years of working in television have clearly given her such a rich visual shorthand that she pulls it off with huge success here. Barbara needs a story. A struggling journalist, she tricks her way into the home of former soap star Margaret Reynolds. Desperate for a scoop on the actress and her return to stardom, she finds instead a terrified woman living alone in a creepy manor house. A piano plays in the night, footsteps run overhead, doors slam in dark corners. The nights are full of strange noises. Barbara thinks there may be a child living upstairs, unseen. Who looks after her? And why is she kept out of sight? Little by little, actress Margaret’s haunting story of broken promises is revealed, and Barbara is left with a chilling discovery. This book comes along at just the right time – it’s perfect for a chilly winter’s night quick read or a late train journey home from the office, but you will want to keep a light on afterwards, you will question every creak from your house as you lay there trying to sleep. Clearly Lynda La Plante is known well for her tough female characters in Prime Suspect, Trial & Retribution, Widows and the Anna Travis series of books but, on this evidence, she can wield a pretty damn good supernatural pen too. The sounds from the rooms above in the house sent me back to another great read from last year ‘The Hunting Ground’ by Cliff McNish and, with the eery image of the rocking horse on the cover and the whole haunted home theme it’s a timely read for anyone wanting more of similar ghostly themes after viewing The Woman in Black this week. Hell ! 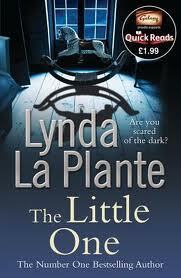 – It’s Lynda La Plante, it’s damn good scary stuff, and it’s only £1.99 – what are you hanging around here for? “Prime Suspect” was brilliant, both the British version and the recently axed US incarnation. It’s a shame . . . Maria Bellow shined in that show! Its wonderful to see variations in book length as everyone’s lifestyle is so different from another’s. As much as I’d love to devour a 500 page tome twice a week, the fact is, I can’t due to work and my own writing and other things going on so its great that Quick Reads exist without degradation of narrative quality. Thanks for bringing this nugget to our attention Keith !